They will just about fry anything. I’ve heard of Snickers and oreos, but bananas? 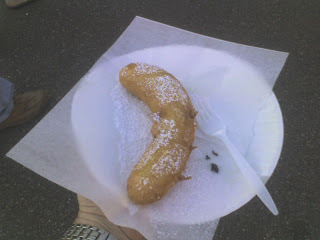 That was one of the foods they served at RioFest. It was good. It tasted like Banana pudding. I was a little disappointed by the festival. They removed the carnival rides. Apparently, this move came last year. I don’t know if it was a budget deal or what. I also wonder if the festival might be struggling. I don’t know why I randomly picked festival weekends to visit. Ain’t that a coincidence?